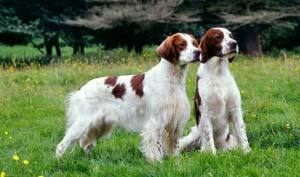 Some of the dog breeds are originated in Ireland, for instance Irish Glen of Imaal Terrier, Irish Red and White Setter, Irish Wolfhounds. If you have such a dog of these breeds, you may consider choosing an Irish name for him or her. Irish dog names are inspired from Irish names and Irish culture. We have pulled together a collection of 142 female Irish names for your girl dogs. These traditional Irish names are of Gaelic or Irish origin, and they are unusual dog names with great meanings. Aednat: Little fire. The feminine of the name Aidan. Ailis: God is my oath. Ailish: God is my oath. Aoibheann: Pleasant, beautiful sheen, of radiant beauty. Beibhinn: White or fair lady. Branna: Beauty with hair as dark as a raven. Brannagh: Beauty with hair as dark as a raven. Caireann: Little friend or little beloved. Cairenn: Little friend or little beloved. Caitlin: A variant of Katherine, meaning "pure". Cathleen: A variant of Katherine, meaning "pure". Ciara: Dark hair and brown eyes. Ciaran: Little friend or little beloved. Deirdre: Raging, broken-hearted, or fear. Eilis: God is my oath. Eilish: God is my oath. Eithne: Kernel of a nut or seed. Eitna: Kernel of a nut or seed. Granuaile: One of the most remarkable women in Irish history. Ida: Thirst for goodness or knowledge. Ide: Thirst for goodness or knowledge. Keela: A beauty that only poetry can capture. Kerry: Dark hair and brown eyes. Kyla: A beauty that only poetry can capture. Maebh: The cause of great joy. Maire: Irish Gaelic form of the name Mary. Mairead: Irish form of Margaret. Muiread: Irish form of Margaret. Muireann: Sea white, sea fair. Muirenn: Sea white, sea fair. Muirgheal: Bright as the sea. Nuala: Fair shouldered, exceptionally lovely. Oonagh: Queen of the Fairies. Sibeal: God is my oath.